Type of works: design, manufacture and installation of bespoke door and hatch solutions. Booth was awarded the complete design, manufacture and installation of bespoke door and hatch solutions. Unable to obtain a proprietary solution, Booth was approached by Halliburton to provide a specialist designed blast-resistant access solution. Each solution provided a power-operated inverted L shaped access profile with a power-operated hinged single leaf door at ground level and a two leaf sliding horizontal hatch at high level. 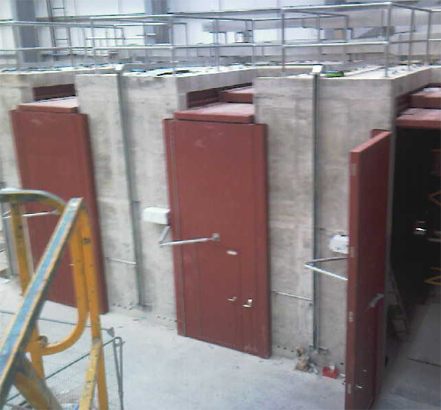 Each hinged door provided a clear opening size 1,600mm wide by 4,985mm high and the hatch provides a clear opening size of 1,600mm wide by 3,324mm long, with blast resistance to 24.15kPa.